Hey, ho, it’s Thursday! And I skipped my writing stream on Twitch this am. Booh! Unfortunately, the term papers I have left are leaving no time for that sort of thing this week. Fun as this has been, I am really looking forward to being done with the term in, I hope, just a few days. I had Failure to Communicate recommended to me when looking for spec-fic with an autistic main character (for, no surprise, the diversity bingo reading challenge). The book follows Xandri Corelel, an autistic human who has found a home on a big starship where she functions as their head of Xeno-Liasons, which means its her job to make first contact with alien species on newly explored planets. She’d drawn into some seriously high-level political intrigue and forced to push her skills to the limit to avoid disaster. I thoroughly enjoyed this book. 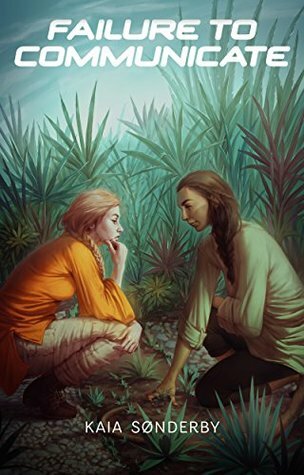 Xandri is a great main character, really well-written and fleshed out, the sort of character that leaves me with a feeling of “hey, I wanted to spend more time with you!” when the book ends. All the characters are great, to be honest. The worldbuilding is great too. It’s sci-fi with sort of a ‘Jim Henson’s Creature Shop’ kind of vibe, with aliens of all sort of shapes and sizes, some that feel familiar and some that feel very unique. Still, somehow, even though such a lot of characters have an unexpected amount of limbs, the story and worldbuilding never feels silly (not to say it isn’t funny in places). The intrigue is great too, though I will admit my favorite part was probably about the 3 first chapters before the main plot really takes of. Xandri’s job is just so interesting, I’d be happy to read more of her “regular” adventures that are a bit less high-stakes than in this books. Kaia Sønderby is a queer, autistic spec-fic writer, hailing from the US and currently living in Sweden (yay!). You can follow her on Twitter @KaiaSonderby and on Goodreads, or you can buy her a coffee on Ko-fi! This entry was posted in Uncategorized and tagged adventboost, adventboost 2017, failure to communicate, Kaia Sønderby by Emma Lindhagen. Bookmark the permalink.